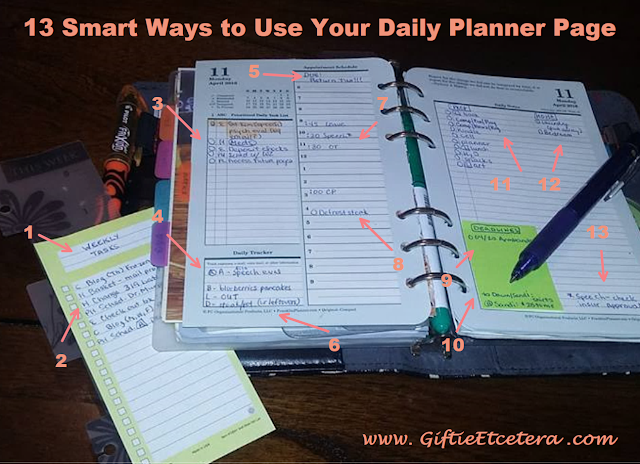 Here are some things that I do to make my planner do its job - keeping me organized. If any of the ideas help you, go ahead and steal them! I put my weekly task list (which I clean up and recopy on Monday mornings, but you might prefer Friday afternoons or Sunday nights) on my page marker so that it shows on any day of the week. Context codes are crazy useful for telling me where I'll be doing the task. For example, if I am sitting in a coffee shop while my child is doing his homeschool work, I might work through computer, planner, and anywhere tasks. However, I won't use the phone, as that would distract my kid. All context codes really are is a shortcut to lead your decision-making. Lots of computer work? Maybe you need to go to a coffee shop and work through it. Tons of errands? Pack an errands bag and lunch-on-the-go. There's only a set amount of time in each day. Focus on the things that need to be done or will make tomorrow easier. Along with my menu plan, I track anything that I am waiting on my husband to take care of in my "daily tracker" area. "@ A" means "after Alan" - my husband - does his part. I usually have something that is critical. If I do, I put it in the top slot of the daily schedule. Seriously. Even if it just says "peanut butter and jelly sandwich," having at least one food option decreases stress (and overspending and unhealthy eating) so much. Remember to include travel time! I need to defrost the steak AFTER I get home but before dinner. I put that task on the schedule because I might miss it on the task list. Errands need to go on the schedule because they take so much time and require leaving the house. A Loyal Reader in the Giftie Etcetera Facebook group came up with this brilliant idea! If you are not depending on a weekly view, you still need to keep upcoming deadlines on the radar. One way is to put them on your monthly pages, but mine are way too jammed up with actual appointments! This pairs well with due dates. Plus, it's a function of a planner that lots of people ignore, but it really helps. I've previously gone on and on about prep lists, so I won't bore you here. TIP: Hide them behind your weekly page marker. You have to do laundry. Seriously. I know. I understand. I don't want to, either. Now go do it. I use an asterisk earlier on my schedule to show there is a note elsewhere. Subscribe via e-mail (in the right sidebar, as I never spam you with pop-ups) to Giftie Etcetera and never miss a planner post again! Consider supporting Giftie Etcetera by buying me a coffee! I like the idea of the weekly task list being on the daily marker page. That way it is harder to miss something you really needed to get done. Loved these tips! I definitely already do some of these, but what helps me most is colour coding and using symbols. I just started bullet journaling and one of the things I carried over from my ordinary planner was to have one colour for the type of tasks - so, for example, school work is blue, music classes are green, blog-related things are red, and anything personal is pink. Definitely helps me to stay on top of everything! You "never spam us with pop-up's"? :D That's the first thing I saw when I opened a link in Pinterest and entered your page. Also, what are context codes, how do they work? I like the context codes idea. I had started jotting those down when I first started bullet journaling. The codes have gone by the way side but I still group tasks that way. Thanks for sharing these great ideas with us at Small Victories Sunday Linkup. Pinned to our linkup board. Can you elaborate on context codes and the use of them in your planning? I need step by step directions on exactly HOW to perform #1 please.